Whilst looking closely at a massive elliptical galaxy and its associated galaxy cluster MACS J1149+2223 — whose light took over 5 billion years to reach us — astronomers have spotted a strange and rare sight. The huge mass of the galaxy and the cluster is bending the light from a much more distant supernova behind them and creating four separate images of it. 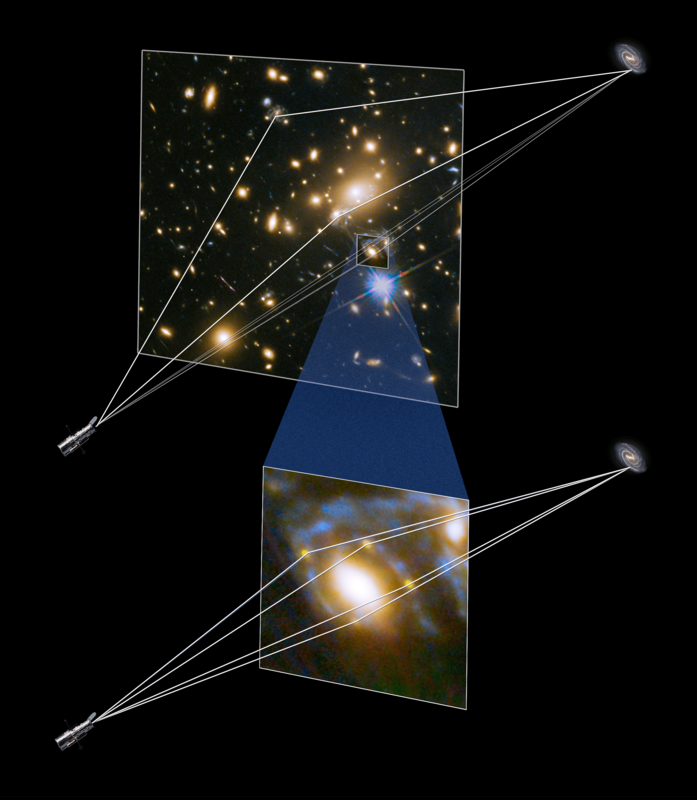 The light has been magnified and distorted due to gravitational lensing and as a result the images are arranged around the elliptical galaxy in a formation known as an Einstein cross. 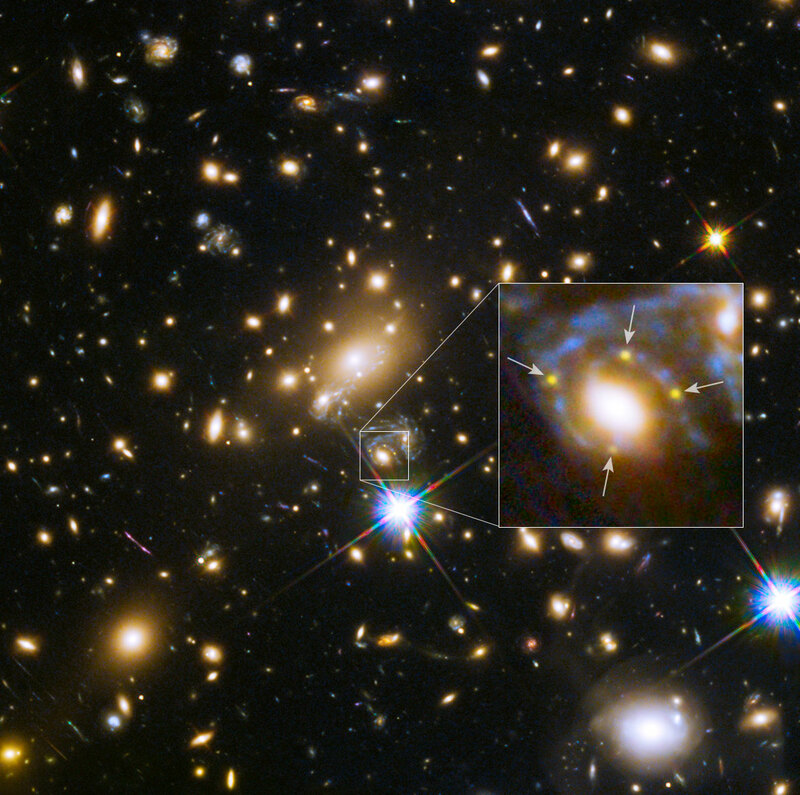 “It really threw me for a loop when I spotted the four images surrounding the galaxy — it was a complete surprise,” said Patrick Kelly of the University of California Berkeley, USA, a member of the Grism Lens Amplified Survey from Space (GLASS) collaboration and lead author on the supernova discovery paper. He discovered the supernova during a routine search of the GLASS team’s data, finding what the GLASS group and the Frontier Fields Supernova team have been searching for since 2013. The teams are now working together to analyse the images of the supernova, whose light took over 9 billion years to reach us. When the four supernova images fade away as the explosion dies down, astronomers will have a rare chance to catch a rerun of the explosion. The supernova images do not arrive at the Earth at the same time because, for each image produced, the light takes a different route. Each route has a different layout of matter — both dark and visible — along its path. this causes bends in the road, and so for some routes the light takes longer to reach us than for others. Astronomers can use their model of how much dark matter is in the cluster, and where it is, to predict when the next image will appear as well as using the time delays they observe to make the mass models even more accurate.